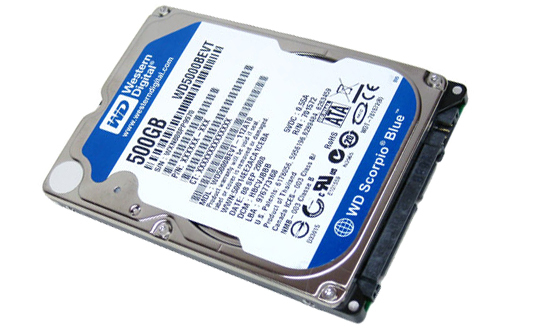 Western Digital Scorpio Blue is a 2.5″ form factor Hard Disk Drive, optimized for you Windows or Mac notebook. The drive reviewed here is a 750 GB laptop HDD. The Scorpio Blue 750 GB HDD has a 8 MB of buffer and have a very fast Sata 3 GB/s port. The drive offers a lots of space for your space hungry operating system and all your games, music, videos and other files can be reliable stored on the drive. It consumes very less power giving extra life to your notebook battery and works very silently, mean to say dose not make noise while the drive is in use. It is very easy to install and partition in the new Windows OS like Win Vista/7. The drive is sleek and simple, if you are planning to upgrade your digital storage capacity of your notebook and seeking a nice reliable drive. This one might fit all your requirements. $ 144 and for around Rs 6,500 in India.